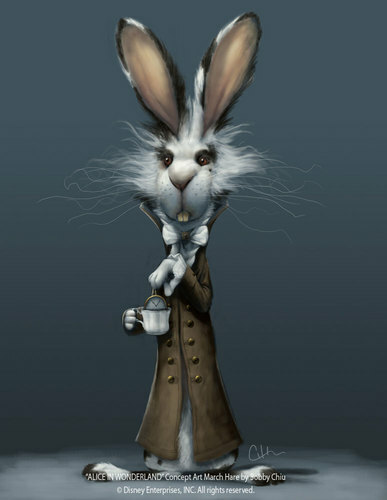 Thackery Earwicket (March Hare) Concept Art. Here is the 'would have been' look for out own Thackery Earwicket!! Quite a change from the final look!. HD Wallpaper and background images in the Alice ở Xứ sở thần tiên (2010) club tagged: alice in wonderland concept art tim burton march hare. Thackery's my favorite. Nobody can replace him at the top of my list of favorite "Alice" characters. If you're a Alice in Wonderland fan and you saw this movie; you'd thank Tim Burton. But if you're the March Hare's biggest fan and you saw this movie; it's like a big middle finger right in your face.